5. What is Compatible Finite Mathematics? Alongside other objectives I hope this subchapter “To Infinity and Back Again” assists others to look at physics and the sciences from a positive “I can,” perspective, regardless of education or common knowledge. One thing is for certain. If you believe you can do anything that is possible, you may or may not do anything that is possible. However if you believe you cannot do something, you will definitely not succeed, as invariably one will not have started. Positivity per se is not necessarily a sure fire magic ticket to instant success. But negativity is a sure fire magic ticket to failure. So whatever one wishes to achieve, the only clear road is via positivity. No matter how gigantic a task may seem, say for instance discovering “The Theory of Everything”; the sooner you start the journey the sooner you will be on your way. And quite often, even if one does not reach the initially desired objective, one’s life will be greatly enhanced by the journey. As briefly mentioned in the previous chapter on the 22nd September 2011 a team of Italian scientists working at the large particle accelerator at CERN, published results that indicated the speed of light had been broken. Only to find out five months later that there was a mechanical error. At the time of the initial publishing it was suggested that Einstein’s Equation E=MC2 was not incorrect per se, rather that there was more to it. So being of the “I can do anything” school of positivity, I thought I’d have a crack at it. And over a 13 hour frenzied day of Steve Jobs styled Zen instinctive thinking the equation E x TOE = MC2 + TOE/∞ -16 = 16 PPG was born. Of course adapting the most famous equation of all time from a starting point of not even knowing what the “C” in E = MC2 stood for (the speed of light), may seem over adventurous to many. But as it turned out, it was an endeavor well worth perusing as it opened the door to what is now the heart of American Butterfly the POP (Pressure of Profit) Investment Principal. Before detailing the journey, first we need to establish what PPG, stands for. This is best established at source. The source entitled “SIS – Spiritually Inspired Software” being the eighth and final section, within the original Facebook Product presentation which was to be filmed in an easy to watch, fun manner. Ok, nice idea but what’s that got to do with S-World? Well if you brake down the various S-World plans and objectives, particularly what we want to achieve, advances in software, physics, ecology, health, alternate energy, housing millions, and in general offering people a more scientific perception of karma and spirituality; we create a more ecological and fair society as well as a more peaceful world. So if successful, S-World will have moved the masses in a desired direction. Exactly, shaping if not changing the future. Have you got another example? The Theory of Everything, what’s that “The Particles of Physics within God”? Quite possibly. I’d certainly like to think so. But until someone can prove it, it’s just a theory. In a way yes, S-World has thousands of business and PR plans. So far I’ve not found one business that will not benefit. Some more than others of course. But so far it does seem to work for everything. But I do claim S-World to be, “The Theory of, just a little more than we know now,” and as such, is a step in the right direction, a step in the desired direction. 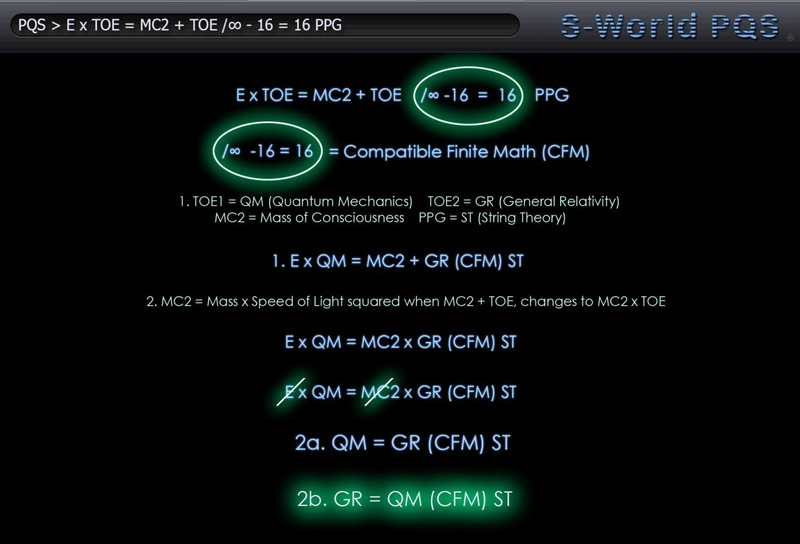 So within E x TOE = MC2 + TOE/∞ -16 = 16 PPG, the PPG is “The Particles of Physics within God.” I had better put down a base marker for God, as referenced. I’d like to think my perception is similar to that of Einstein and Bohr, their “God does not roll dice,” and counter, “Stop telling God what to do.” The exchange feels similar to my perspective. Which is to consider our universe without a God as an orphan and God as someone that could answer any question one would like to ask. Be it a divine being, or a single soul from a hyper evolved species in another Universe communicating via high gravity bursts. In the last chapter we looked at the Multiverse Entanglement Butterfly Principle and saw the Butterfly Effect graphic transcending the Multiverse. This is as best a description as I have yet visualized as PPG. And so for the best part, within the equation we should consider the PPG as a form of String or M Theory. So to the balance of the equation, E x TOE = MC2 + TOE/∞ -16 = 16, to start with. At that time of writing I had no technical knowledge of Quantum Mechanics, General Relativity or Contemporary String Theory. I did however have a great appreciation for the concept of The Theory of Everything as its words seemed to fit the S-World business model. So The Theory of Everything (TOE) became the key addition, which seemed apt if one was looking to solve the mysteries of the universe. The important constituent within the equation in terms of the progression of American Butterfly was the “TOE/∞ -16” or “/∞ -16 = 16” being equal to Compatible Finite Mathematics. Or at least being the trigger that started the investigation into same. Before elaborating for posterity, a brief explanation of the rest of the equation as considered in hindsight with greater knowledge of actual physics is presented. Firstly applying Quantum Mechanics to one TOE and General Relativity to the other is an obvious move as TOE for the best part is specific to what will unify the two. And so I now interpret the first result, E x QM = MC2 + GR (CFM) ST as the consideration of S-World UCS where the mass of our consciousness is added to our reality (General Relativity) then sent into the future. The plus being indicative of our ability to control the simulations. The ability to place them in a time of our choosing. In this case QM would be a contingent of Quantum Mechanics yet to be specified, possibly a Quantum Field. Secondly our 2a: GR = QM (CFM) ST, reverts the plus back to a multiplier as was suggested as a possible alterative within the original equation. Here we see the result is specific to suggesting General Relativity will unify with Quantum Mechanics via String Theory, with assistance from a Finite Mathematical Principle. So to the CFM Compatible Finite Mathematics, or as previously named Chaos Science “/∞ -16 = 16”, to start the lazy 8 “∞” is infinity, which seemed appropriate as the very concept of “The Theory of Everything” in any format added to the speed of light had a very infinite demur to it. My general take on the situation revolved around the idea that, as infinite and out of reach as a Theory of Everything could be, it must exist. My consideration was that it would not be just one or two theories combined rather many, or maybe all theories applied from a positive (with good intentions) perspective. For example use Einstein’s Theory to build nuclear engines to power a spaceship to aid exploration, rather than build bombs to blow up the world. And so the concept of positivity was introduced, to defy the infinite nature of a Theory of Everything. Reverse infinity and backtrack to a point of accurate reference, to go to “Infinity and Back Again” required the components to work together and become more than the sum of their parts, they needed to become circular. The initial component adding strength to all others, then becoming re-stimulated by those that it stimulated. The system needed to be akin to a positive Butterfly Effect. To arrive at the number 16, I simply considered five theories, and gave them a score. To simplify I made their score double the sum of their parts. The five initial theories considered were: The Theory of Evolution, String Theory, The Theory of Relativity, Chaos Theory, and The Spartan Theory. One doubled equaled to 2. This doubled to 4, so on to 8 and finally 16. After creating the five theory model I considered more factors and soon the doubling up process started to offer very high numbers seemingly rushing back from infinity at an expediential rate. That was all it was, not physics, rather a philosophy. Before continuing with events, I’d like to set the scene in terms of the direction of my work up to and at the time of writing the equation. By sharing an extract from my first complete physics chapter placed on www.s-world.biz entitled “EEE The Economy for the next 14 Billion Years,” compiled in October 2011 from consideration made over the previous months. One day in 1961 Edward Lorenz, mathematician and meteorologist, entered some numbers into a computer program simulating weather patterns and then left his office to get a cup of coffee while the machine ran. When he returned he noticed the sequence had evolved differently, ending up wildly different from the original. The computer model was based on 12 variables, representing things like temperature and wind speed. On this day Lorenz was repeating a simulation he’d run earlier—but he had rounded off one variable from .506127 to .506. To his surprise, that tiny alteration drastically transformed the whole pattern his program produced. The unexpected result led Lorenz to a powerful insight about the way nature works: small changes can have large consequences. The idea came to be known as “The Butterfly Effect” after Lorenz suggested that the flap of a butterfly’s wings might ultimately cause a tornado. I say: The global economy is a complex chaotic system, rendering long term prediction impossible. Until recently I’d never really considered the rounding errors within the financial software as such a problem. Not compared to the human error and fraud which would be elevated due to the system. This said the more I considered “Chaos Theory” and I guess respected it, even understood it; albeit in an unconventional way I started to think more about the rounding errors. I wanted to solve the problem. And so another item was added to the “what I wish to achieve” list. At first I wondered if it was already possible. Then later on thought no because if they could calculate to infinity that would have made the news. Then I wondered if Mark Zuckerberg could do it. And for a while, I just thought, the problem would soon be in his capable hands. But then the contemplation that it simply can’t be done, Mark Z or no Mark Z, infinity is infinite. By its very definition it can not be calculated. Before moving on it needs mentioning that my TOE/∞ -16 Equation was not the sole guide to the significance of doubling and compartmentalizing numbers and creating circular events. In many ways the principle had been ingrained into my psyche since the age of 16 when I purchased a basic Roland drum machine. This led to the purchase of a Roland W-30 sampler sequencer and on to the Q-Bass music sequencing software, which led me to spending the 1990s programming music as my profession. Each day working within subsets of 16 compartments within each music bar, building the bars of music into sets of eight before slotting them together to make a song. When I moved into this century I stayed with the same mathematical principles. However this time within the internet animation program, Flash, which by 2002 had created the inspiration for S-World VSN and UCS. All told I had spent 15 years of my life working almost daily with sets of 16, within sets of 8, overlaying 64 adjacent versions. Quantizing, experimenting and playing with various intricate string and precision patterns. Another influence was the April 2011 concept of gaining additional PR by structuring the Global Network. Or at that time what was better considered a set of 16 Global Franchises around a FIFA Global Soccer League. A concept they very much desired and a company I had good relations with. The Number 16 came about as the optimum amount of teams in a league that was expected to also play a knockout competition every second year 16/8/4/2/Winner. Fortunately 6 months later by the time the significance of such numbers presented themselves from a mathematical perspective, the Global Network in terms of conglomerates, locations and sub divisions within locations was already nicely formatted within divisible sets. A day or two after writing the TOE/∞ -16 equation, the significance of the infinity defying mathematics fixed in my mind, I searched the web regarding the subjects of infinity and doubling numbers. 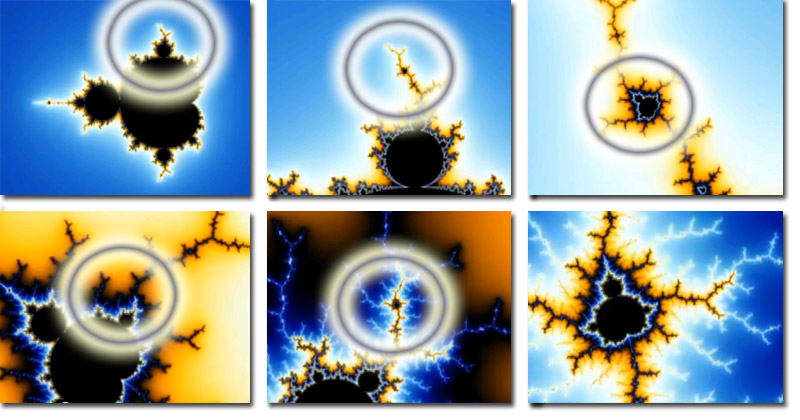 And I found something beautiful, The Mandelbrot Set Fractal. The Mandelbrot Set was discovered or more specifically created by Benoit B. Mandelbrot on the 1st march 1980 at IBM’s Thomas Day Watson Research Center in New York. If you follow the pictures you will see how it literally becomes itself within in itself over and over, duplication upon duplication. Within the Mandelbrot Set, a fine balance between infinite and finite mathematics is forever present, much like the principle I was looking to describe with “/∞ -16”. Wherever you see a black pixel, the mathematics is finite. Wherever you see a color, it represents an infinite calculation. As such within the Mandelbrot Set proper (the black shape) we see a continually duplicating system that defies infinity. This is known as fractal geometry. To really grasp it you will need to look on the web. There are many examples, the most detailed in terms of both graphical content and documentary is: “Arthur Clarke – Fractals – The Colors of Infinity.” The following dialogue contains extracts. The documentary starts with a computer simulation of a Mandelbrot Set about 6 inches across. Similar to the Set illustrated in the first picture above. It is then magnified 13 times and we see more detail appearing. We start to see mini Mandelbrot Sets, replicas almost identical yet subtly different. Then the magnification is increased to 3000 times so the original six inch picture would be half a mile wide, and we see more detail and more mini sets. On to a magnification of a billion times so the original set is bigger than our entire Universe, we still see new patterns and images emerging. The Mandelbrot Set is infinitely complex. Whist the Mandelbrot Set is infinitely complex, it’s based on incredibly simple principles which highlight the fact that very simple formulas can offer very complex results. Much like Einstein’s E=MC2 is a very simple equation with far reaching consequences. The equation for the Mandelbrot set is equally simple Z⇔Z2+C, however unlike Einstein’s equation where the letters stand for the physical quantities Energy, Mass & Velocity. The letters in the Mandelbrot equation stand for numbers. The numbers are coordinates, positions on a plane defining the location of a point of reference. Another important difference to E=MC2 is the double arrow (⇔). Which is best described as a kind of two-way traffic sign. The numbers flow in both directions ultimately feeding back on themselves. This process of going round and round a loop is called iteration. The output of one operation becomes the input of another and so on and on and on. This ⇔ behavior is in many ways the essence of the circular events’ infinity defying quality I was trying to portray within TOE/∞ -16 = 16 PPG, which may have been better written TOE/∞ -16 ⇔ 16 PPG. One of the most striking facets of the Mandelbrot set is the internal consistency. If you look at the boundary and zoom in you will find baby Mandelbrot sets. Perfect in every detail but slightly bent and decorated by slightly different external features. Then if you zoom into the boundary of the baby Mandelbrot one finds: baby, baby Mandelbrot sets, the second generation, and inside those a third generation. And this goes on forever. Islands of order in a sea of chaos. This consideration alongside the double arrow greatly influenced the key American Butterfly Signature equation: M⇔BST. Where the Mother of each league or string creates circular feedback loops with the rest of her sibling league or string. This observation is significant to the forthcoming POP Investment Principle and the creation of Network Strings or Leagues, which grow in the same fashion. Baby networks, create more baby networks. All islands of order in a sea of chaos, all designed to benefit one another via the specifically programmed Butterfly Effect waves. The Mandelbrot set is also assimilated to DNA. Whereby DNA per se is a simple sequence of values that defines the species. However, DNA does not define the individual, it just provides the starting position. Again this is similar to the POP Investment principle. The word fractal means any geometrical structure that has detail on all scales of magnification. No matter how big you make it you still see extra details you did not see before. In other words, it never ends. And as such replicating its qualities within an economic system would suggest or even dictate continual growth. Interesting question to which I would need to offer a candid answer. And say, currently CFM is a set of tricks that aim to collectively illuminate rounding errors within the Global Economic Structure. A desire to create a simple growth DNA principle, from which a seemingly magical economic system evolves. I say tricks as some constituents, indeed the most significant constituents are very simple. Not featuring and any complicated mathematics or equations. More rules than mathematics per se. Consider this simple form of CFM in terms of “Diverts,” on the Macro (Big) Economic Scale. We have the POP (Pressure of Profit) Investment Principle which after a fixed value diverts profit into sibling networks. On the Micro or Quantum economic scale we have QDP (Quantum Divert Principle) which diverts all transaction less than $0.01 or possibly $0.0001 to a Special Projects recycle fund. The use of diverts, as opposed to rounding, is what keeps order. And as will be illustrated shortly the very practice of attempting to create a more orderly system created significant results. Let’s have a quick look at QDP the Quantum Divert Principle and consider an individual US Resort Network. Within it we find 4,096 business sectors with two maybe four times as many staff alongside various operations, properties, shops, residents, and visitors. All shops, suppliers, businesses, banks, land registries, tax levies and salary payments are connected to the S-World.Biz financial software. All calculated in real time so that at any given moment one knows exactly how much money is within the individual Resort Network economy. With modern computing on the scale of an individual network, this seems a relatively simple task. Until an infinite number arrives with a recurring decimal which is periodic, a finite sequence of digits repeated indefinitely. For instance, a company offers three of its staff members an incentive bonus of $1000 if they achieve a set target. Once achieved each staff member will be due $333.333333333333333333333.r (r=recurring), the sequence of 3’s infinite, indeed far, far, far greater than the amount of atoms in our observable universe. Currently banks and financial software will round this figure to say $333.33 with the balance of three’s lost somewhere in the system. It is this rounding, as per Lorenzian Chaos Theory and The Butterfly Effect that yields the widely diverging outcomes for economic systems, rendering long-term prediction impossible. So instead of rounding we divert, as such each staff member will receive the same $333.33 with the balance the $0.0033333.r diverted to the Special Projects fund. Whereby within this fund the three complimentary sets combine to make an even cent. The financial software was always going to take a small per transaction fee, indeed this way equals less than the initial consideration, so its hardly an imposition. And if it is seen as so, we can change it to $0.000033. Of course the calculations will not always be so simple. Often a $0.0033.r will come in individually and have to wait for a couple of its symmetrical friends to arrive. Further from time to time a highly complex recurring number may appear such as 3227/555 = 5.8144144144…… where the 144 is repeated indefinitely. To this I have no definitive answer and ask for assistance from the physics and mathematics communities to assist. There may be an answer within fractal geometry, the mathematics of String Theory or Quantum Mechanics, but most likely Supersymmetry I feel. However, as such numbers are held within the proverbial “recycle bin” Special Projects Provision, to a certain degree they are ring fenced. Separated from the day to day trading of the individual Resort Network economy and in turn the Global Network economy proper. Even without a magic system or formula compressing all loose end numbers together within the provision would result in the discrepancy in comparison to the Network economy being tiny. The equivalent of a Planck Length, theorized and widely accepted to be the smallest possible scale, at 1.616199 × 10-35. The Quantum Divert Principle is a relatively new addition to American Butterfly. And is a platform for others to add to before moving to the POP Investment principle. A quick word on Planck Length and the possibility of structuring the Network economy and make up around it, or another suitable figure. In general alongside the elimination of chaotic mathematics we are trying to follow the natural world wherever possible. And whilst the general specification to the physics and mathematics communities is to make the Network mathematics and structure based on the best possible set of physical rules, not necessarily the specific make up of our Universe, in general where possible; we will follow the rules that govern our universe. When it comes to the currency of the network and the structure of network growth it would seem to make sense that we base the core calculations not specifically one dollar or one billion dollars, rather the currency should reflect the natural world. As such all calculations may end up as a multiple of a universal constant, or if possible a Multiverse constant. For example POP (the fuel that drives quantum economics) may end up as a Planck length (h) x 8 x 51.5 within the time our planet revolves around its sun. “When we look around the world there appear to be about 20 numbers that really describe our universe, these are numbers like the mass of the particles, the electrons and quarks, the strength of gravity and the electro magnetic force. A list of 20 numbers that have been measured with increasable precision, but no one has an explanation as why the numbers have the particular values that they do. We believe an answer to why the numbers have the values that they do may rely on the form of the extra dimensions. More recently, in April this year in his latest TED lecture, a very excited Brian Greene revealed another constant. I too was excited. The reason for my excitement was that is was a measurement for “Repulsive Gravity” as first theorized by Einstein, in his “Theory of Gravity.” As generated by the invisible mist that fills most of our universe known as Dark Energy. Whereby it creates the opposite action to gravity, instead of pulling things towards it, it repels objects. As such if M-Theory is correct we have found another measurement for a force or messenger partial that may be able to transcend dimensions into other Universes. And as such another potential vehicle for the Multiverse Entanglement Butterfly has been measured. On the downside it is forcing our own universe to expand at such a rate that in the future we will not see so many stars in the sky as all other galaxies will be to far away. This also could greatly hamper our colonization of our universe. Although this will not happen for a long time. By which I’d hope we will have worked out the kinks in the “Star Trek” entanglement teleport devise and will be able to go pretty much where ever we wish. For the record the force of repulsive gravity is 1.38 × 10-122 a ridiculously small number. Brian’s excitement was due to there being no explanation for this number within the physics that we know, Classical Physics, General Relativity or Quantum Mechanics. So opening the door to String Theory and the Multiverse in that other universes may well have a different shape for the extra 6 dimensions. And as the shape of the dimensions effects the strings that effect all that is within the universes, each universe would have a different value for the value for Dark Energy. Indeed, we are very fortunate our Universe has the number it does. A higher or lower number without a shift in the numbers of many other of the universes constants would have lead to galaxies and planets not forming and we would have nowhere to live. So we may need to pick one of the 21 numbers. And have that as the base number for the POP network currency and structural make up, as per cubed (multiply by 8, not 2) constriction method. Until someone has a better idea we will be sticking with the Planck Length as potentially a number that is not specific to dimension, a possible Multiverse Constant. Currently the POP Investment Principle works at a starting position of $1Billion per year in profit, from which point everything else is calculated. Not just financially, but the number of networks. And so the amount of energy projects, the amount of operation centers, the amount of hardware, the amount of business sectors and so on. This does complicate things a little which is not always the best thing. But like I had a feeling removing rounding errors would lead to something surprising. I have the same feeling about basing the network structure on a universally translatable number, be it Planck Length or other. For now, we shall not concern ourselves with this and revert back to the $1Billion POP value, in anticipation of further advice regarding this topic. Before moving onto to POP, a quick explanation of the cube (x8) principle, taking the “counting in doubles” principle further. 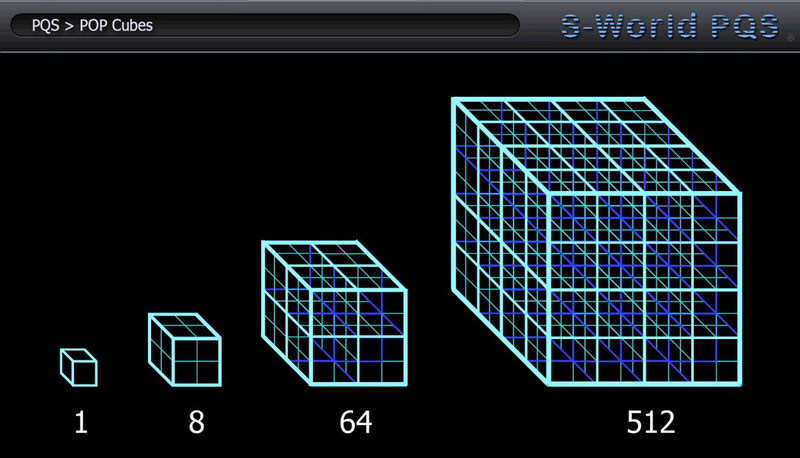 A more efficient way to count, or more to the point, compartmentalize particularly from a visual perspective, is to count in a cubed format. So instead on 1>2>4>8>16>32 we have 1>8>64>512>4096>32768. Below we see this operation in progress with eight single cubes forming a larger cube and so on. Geometrically this is the simplest way to count; as such this framework becomes the structure for the Global Network, where by the year 2036 US BABY POP target is to create two sets of 4096 cubes. More detail is provided in the following chapter. Then in April 2012 an adaptation called Baby POP stopped and the then draught of American Butterfly dead in its tracks, dictating a complete re write. Building the proverbial team around the man, the analogy at the time. Like Barcelona and Lionel Messi, where BABY POP was Lionel Messi and American Butterfly Barcelona. Finally, in August 2012 a further adaptation, Angel POP, turned American Butterfly on its head once again. Illuminating the way to a Global Solution. There are 5 analogies POP worthy of a mention, presented in order of consideration. For over 20 years, come rain or shine, McDonald’s have increased their dividend offerings. There is a good argument that if they had not they would have overtaken Apple as the world’s most financially successful company, especially if they diversified. This is why: McDonalds control the franchises of over 30,000 restaurants and take about 5% of their turnover each year. One part of this is used to pay dividends. Another part is used to purchase new land to build more restaurants, to open more franchises. Each new restaurant increases their overall income, and at the same time McDonalds are continually increasing their balance sheet with more capital assets. So long as people still wish to eat at McDonalds it is a continuous growth model. And if they did not, the company is still strong and in a good position to diversify. Please consider: Tomorrow if Quantum Mechanics went on strike…Apple, Facebook, Google and Microsoft would be out of business and save any offices they may own be penniless. Alternatively, if the world turned vegetarian, McDonalds would still be worth billions and billions of dollars. If we consider Jimi Hendrix we would not necessary apply the phase “An Island of order in a sea of Chaos.” Indeed we would not use the word order at all. Please imagine a Jimi Hendrix song. Now consider him playing wild and free, live, stoned and on acid, lots of acid, playing freestyle. Jamming with the band as opposed to a following a particular song structure. I hope you have a suitably chaotic song in mind. But the song has perfect order, as applied by the precision. The compartmentalizing of time by beats keeps everything together. As soon as each eight bars of music are complete, it’s the beginning of a new section, a new chapter. The previous chapter, as chaotic as it may sound, orderly on reexamination broken up into specific bars. Once the sound gets to the end of the bar, its compartmentalized, contained & given order. Indeed, so much order that the audience can relate perfectly to the song. The POP investment principal follows this pattern, where companies may trade wild and free. Making as much as they like, but at a certain point of profitability a line is drawn. And from that point onwards, the additional profit is invested into a new network. This being so, one always knows exactly how much profit a network will internally record. In economics the base principle of stopping profitability at the optimum level is called “?????”. On a big scale or a small scale, there comes a time of optimum profitability. Where yes one could make more revenue by perusing expansion. But it comes at risk and greater expense, and a lowering of the revenue vs. profit ratio. An example may be a highly profitable Indian restaurant in a mid-sized town that is full each night. So the owners open another, then another so there are three restaurants in the town. With only so many people wishing to eat at an Indian restaurant, each new restaurant leads to all restaurants reduced profitability, but a tripling of costs. Further as the restaurants are no longer full, they lose their exclusivity factor which could further decrease profits. And as the owners are now having to manage 3 sets of problems their focus is less and their ability to keep an eye on staff honesty and qualities is lessened. Everything told its quite possible that whist revenue has increased, profitability remains the same. In general, if the restaurateur’s entrepreneurial nature was such that expansion was inevitable, it would have been a better move to open the second and third restaurants in other towns. Where there will be no direct or internal competitors. In its classic form POP creates an absolute picture of the Global Economy on the Macro (grand) Economic Scale, when considered as a Global Picture as pictured below. 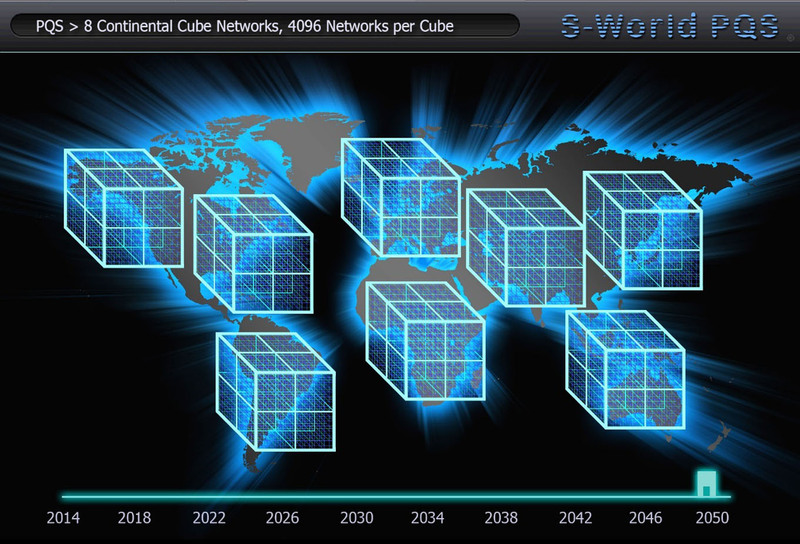 Where each of the large continental cubes represents 4,096 individual networks, unless a network is generating above its POP target ($1Billion profit per year) then it does not exist. A zoom in would see holes within the continental cubes. Or more specifically in an absolute pure model, continental cubes can not be displayed as whole units until all component networks are in POP. As one can only add or subtract, alongside the basic nature of individual networks which protect their strings (leagues) and clump together in sets of 8, 16 and 64…. There is no way, there will ever be problems with rounding errors. Even after say 14 Billion years of growth, and the Network Economy is Universal. POP creates an absolute Firewall against Chaos on the Macro Economic Scale. No one knows how the strings in String Theory gain their energy. In the next subchapter we will see a hypothesis on this called Tuning Theory, reverse engendered from the POP network growth strategy/procedures entitled Satellite String Networks, Super String Networks, & Quantum String Networks. The Graviton is hypothesized to be the invisible messenger particle that energizes strings. Capable of traveling from Multiverse to Multiverse. If this was so and considering the Multiverse from the perspective of there is other sentient life, and this life has worked out how to send messages or assist other universes via gravity; this would surely make gravity a would be treasured commodity, possibly the most valuable commodity in the Universe. However, let’s say our hyper intelligent friends have enough gravity, so they send some our way. As they see potential in our kind within our universe, they are investing in our universe and so our universe grows. Our universe becomes a franchise of sorts. The POP investment principle works in a similar way. Except instead of creating and assisting other Universes, the parent founding Networks using gravity, we transit money via electronic method. Which as there is no physical exchange if one was not aware of the process, one could not see it. However, this exchange enables the building of resorts, hospitals, the universities, and all that goes with it. So POP has the properties of a messenger particle. It is not physical, but it energizes its recipient regardless. POP was discovered in the creation of a graphic a few days after the E x TOE = MC2 + TOE/∞ -16 = 16 PPG equation had lead to the Mandelbrot fractal, and the realization that one could make a complex system that was devoid of rounding errors. Before delving in, it would seem appropriate to detail a little history to set the scene of S-World at the time of discovery. In 2003, utilizing the original prototype of S-World VSN with the assistance of the families of Nelson Mandela and Walter Sisulu the product was set to be linked to the Galileo or Saber GDS’s to create a global travel network entitled Lux Guides. However low bandwidth and other technical issues hampered the launch. 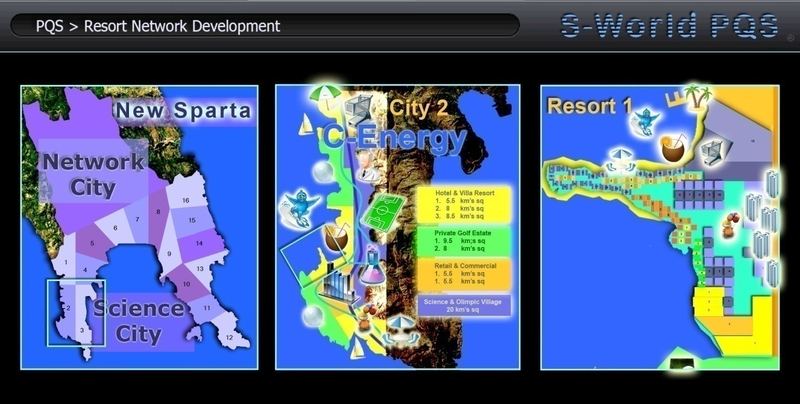 Come April 2011, the S-World VSN concept was upgraded from 2D Virtual Tour to 3D Virtual World and was entangled with the S-Web and S-World.biz components. At this point, all told, there was no doubt in my mind that the combined product was the future of Global Business Networking. My confidence expressed by my realization that as profit was close to limitless I did not need it, and so I pleaded my share to good causes. The decision to use my money in philanthropic endeavors immediately returned gratification. Firstly, in the obvious PR benefit to the Network. But more than that creatively, within 4 days from the 4th to the 8th April 2011 I was rewarded with three updates to the network design: The Sienna Project, The Ecological Experience Economy, and The Spartan Theory. By the time I had unraveled the potential, figures were reaching a point where the most appropriate measurement was in percentage of Global GDP. A brief flirtation with Google came to an end when I for the first time saw the film “The Social Network.” And when it became apparent that Mark Zuckerberg was motivated by success not money, he and Facebook became the only choice as first technical contact. This still holds true today. By July Chaos Theory and The Butterfly Effect were added to the mix, initially on two fronts: Firstly in terms of the financial software, which was designed to link directly to banks, and eliminate human error. I consider if rounding errors made for a chaotic economic system, this was a small consideration in comparison to human error and fraud. Secondly was the consideration of the Butterfly Effect in reversing the negative cause and effects that were hampering the Euro Zone. Specifically, Greece potentially defaulting on its loans and making various banks vulnerable, which in turn made their parent countries vulnerable. Creating a gigantic negative ripple to all the citizens and businesses within the countries. So, by turning Greece’s fortunes around and strategically reversing the scenario a profound positive effect would result. By the end of August, the business plan was ready for Facebook. It included Facebook Gifts, S-World VSN, S-World.Biz, S-Web alongside profitable ventures in Travel and Real Estate, and a solid investment plan to cover all other industries. Unfortunately, as it turned out getting in touch with Facebook was not an easy procedure. This said and in hindsight had Facebook been contactable, that would have been that, and American Butterfly would never be. So really the phase should be: fortunately as it turned out, getting in touch with Facebook was not an easy procedure. With the network plan, now having a foothold in all industries, and Facebook uncontactable; the focus steered towards the economic (governmental) targets. And the resort development contingent originally considered in April came back into play and the second chapter or maybe better put book of The Spartan Theory began “Sparta Rises Again”. This revolved around the creation of a gigantic new city in Laconia, Southern Greece named “New Sparta City of Science,” where S-World would have its base. And within the City of Science the software development would begin. This greatly assisted all the industries’ approach. As it meant companies that saw no immediate benefit other than future technical achievements would received capital assets in part ownership of the land and buildings in Science City. The consideration at the time was for New Sparta to be Greek, but a self taxing republic. The tax of sorts entitled “Give Half Back” which was in essence the profit that should by rights have been mine, but used to fund the research, upkeep the city and fund ecological and philanthropic projects. The economic plan was solid. An investment contingency was in place to cover Greece’s annual economic shortfall for 4 years. In which time New Sparta would network 500,000 businesses in Greece. This was brilliant, as it created a critical mass of businesses. Big enough to make the software and network competent in all industries, with collective ordering and financial efficiency increasing profitability across all sectors. This would require a Greek Referendum to make usage of the software mandatory, but there was no way the Greek people were going to say no. The economic principle was very simple. The Greek annual deficit was about the same as their reported loss of income due to tax evasion. So instead of the S-World.biz software just calculating tax it would pay it automatically. As such within 4 years, Greece was due to be one of the only countries in the world to be breaking even. On top of this, the construction and settlement of the City would create more jobs that there were unemployed Greek citizens. Dramatically lowering welfare costs and stimulating the entire Greek economy. As such come 2017 Greece would be making a substantial profit. This of course increases confidence and so investment and business opportunities for the rest of Greece. The positive effects become circular and Greece becomes an economic powerhouse. Going into the investment and profit models will take too long. Other than to say for industries without a specific plan, a combination of the “Window Factory” tender model and the “Location Butterfly” Real Estate model were added to the general “keep up with the Joneses” investment philosophy. Should you wish for more information, there are many notes on www.S-World.Biz. 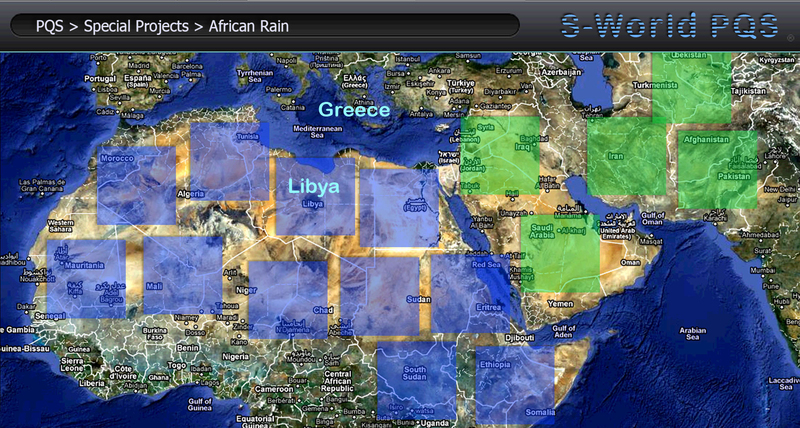 One aspect that needs specific mentioning was the influence for the African Rain Special Project. Whist planning ways to make New Sparta a “Location, Location, Location” enhanced city, many interesting “Wow” features were thrown into the hat. Including a solar powered desalination plant that would pump enough water to turn large arid areas into botanical gardens and in time rain forests. This caught the imagination of S-World no2 Mike Enslin and the African Rain Special Project was conceived, here is the original graphic. POP, The Pressure of Profit investment principle, became a factor when plotting the profit Facebook would make from the Facebook Travel 2017 financial forecasts in terms of global assistance. I had not given up my share of income just to make Facebook rich. Facebook like all other companies are simply economic, ecological and philanthropic vehicles. To maximize the positive Butterfly Effect from Greece, one needed not only to stabilize Greece but to go forth. At that time specifically considered was Libya into Africa, and Spain, Italy, Portugal and Ireland. And so profits were to be used to create new Science Cities there and across the globe. Ironically, in the here and now, the income for Travel its now so trivial. It gets but a passing mention, and is no longer attached to Facebook. But at the time the $68 Billion a year by 2017 represented a significant sum. I considered if Facebook were to set a limit to their profit in sequence with the doubling of numbers, in blocks of 4 so avoiding odd numbers. When tallying up the profit from all sectors and all industries in the same fashion, the Macro Economic picture would be devoid rounding errors, and at the same time it would make their profit predictable. So long as each sector performed, year on year in their particular location, their profit would be exactly whatever the profit limit was set at. At the time the figure of $4 Billion per year was considered. As such, as soon as a sector generated over $4 Billion the rest of the profit made would be invested into a new development, a new network in another country. There was no disadvantage for companies in a network. As the companies own what they invest in and profited from the new businesses created. Indeed, as it would turn out when retail, construction and the rest of the industries were added; POP become a distinct advantage. As with the creation of a new network comes a host of new local businesses wishing to join. A new catchment area of people to spend money and a new batch of willing employees. Plus from a network perspective a new operations centre, university, research centre, super computer, solar array and SURH (Super University Resort Hospital). So I started to make a graphic. And whist it’s very obvious what would happen I did not realize till I saw it for my own eyes. Three years at Photography and Graphic Design Colleges paying off at last. Of course, when you had two networks both generating above their profit ceiling, the flow of excess profit into the third network, is double, then treble, and so on. Until by the time the 5th network is contributing, the flow takes on an almost magical growth dynamic, new networks launching year on year. As obvious as this may appear to be, if it was that obvious someone would have done it before. I firmly believe this was a realization that showed that just by trying to add order to economics, you gain significant advantages. I had said to myself regarding the elimination of rounding errors: “I bet if I worked it out, something really cool would happen.” And this was the really cool something. Just because its incredibly simple, it does not negate its immense power. In fact, when it comes to math’s and physics, it seems the one thing everyone agrees on is the simpler it is the better it is. The more symmetrical, the more natural. Next I plotted a scenario. Taking into account 16 networks, or more specifically at the time, the 16 industry sectors within New Sparta. Whist this was slightly unrealistic as it was unlikely all sectors would perform evenly, it illustrated the global expansion potential. At the time the outer red dots were considered as “the edge of chaos.” A possible limit to expansion whereby all the inner dots were safe, and we would see a kind of “battle line against poverty” in the outer rim. In the here and now, with a year’s progress to the model, this is no longer the case assisted by the principle equations M⇔Bst, QS+AR>+100% and in general the diversified nature of the network. Indeed ELE’s aside the only threat to network growth is running out of things to build. Hence the greater impetus for Special Projects, from immediately practical projects such as African Rain to Extended Space programs, and to other complexity protection exercises. The creation of the POP investment principle saw the creation of the first chapter that put science center stage with economics. The POP principle was considered very much a Macro Economic Solution. It did not solve the problem of rounding errors within the individual elements of the Network, but over time, the expansion would lead to hundreds then thousands of $4 Billion blocks. The simple fact that one could only add in sets of four meant to save an infinite amount of $4 Billion blocks. There was no way to create an infinite recurring number. The chapter was entitled “EEE – The Economy for the next 14 Billion Years.” In terms of the elimination of rounding errors it may be best summed up by the final tongue in cheek graphic. Which was in part a tribute to little Sahara Hafez, Chaos Theory herself. As without her influence I would not have looked up Chaos Theory to begin with. At the time the one thing that would stop her chaos in its tracks was Barney. Footnote: Don’t be disappointed in Criss. If there is such a thing as a human Butterfly Effect and it is in some way connected to American Butterfly, Criss did exactly what he was supposed to do. As there was much more to be done and much more was done. So once again the bar had to be raised. Fortunately, there was an abundance of US economic data available on the web. The needs of the USA were very different to Greece. However, it soon became clear that if the US Medical liabilities were taken care of, their economy would flourish again. Albeit to create a sustainable long term solution fossil fuel dependency would also need to be tackled. This meant hospitals and a complete take over of the pharmaceutical industry. Either via allocating research money or alliance with the pharmaceutical companies alongside the creation of an awful lot of alternate energy sources. The later having the advantage of being in general a safe investment leading to an enormous annual revenue stream for the network once complete. Initially the idea was to replicate the New Sparta Science City 16 times. The full new Sparta Model in today’s terms meant, 8,192 separate Networks, 512 per City. This was soon split up, a combination of large and small networks. The concept of smaller networks bringing the advantage of having operation centers and hospitals nearer to the businesses and people they would support. By February 2012 the first version of American Butterfly was created. But on running the figures, I was for the first time since the envisagement on the Sienna Project uncertain of success. The trouble was, logistics aside with so many Networks, the big money making concepts were split between too many Networks. And so there was not enough profit to start the POP process, which at the time it required companies to make in annual 100% profit compared to their investment. In short there was to much internal competition. Being from the school of “double your efforts” unbreakable positivity, this problem troubled me for about a day. Encouraged by the conceptualizing of what is now entitled QuESC I muddled on, confident the solution would arise at some point. I started to create a basic version of the PQS in the form of a combination of interlinked spread sheets, alongside working on various aspects of the economics. In particular homing in on the exact figures needed for the Medical Liabilities and Alternate Energy devices. Until in the middle of March the combination of influences led me to create “Quantum Force Theory.” Which turned the project to concentrate on maximizing the profit vs. revenue of each Network (This is detailed in the following chapter.). This concept added to the PQS Data indicated that if the initial number of Networks were reduced and we looked at an adaptation of the POP investment principle we could make it work. And by mid-April the initial set of networks was down from 8,192 to 256, with a second phase planned two years later. With the new version of the POP investment principle creating Network Strings, 16 per network over a 22-year period. The initial parent networks benefiting from various exclusive income sources like Facebook Gifts and tenders from their Strings. Plus the slow creation of the String gave plenty of time for each network to establish itself. But most of all, due to BABY POP, the string and all networks within were safe, permanently. Like the original POP principle, Baby POP seemed like a God sent magical solution. The reason for the name Baby POP is because Baby POP does not conform to the creation of solid stable predictable economic blocks, rather it simply follows the expansion method. Sowing the seeds for the creation of a network string to come to its actual predictable state at a later juncture. Before presenting the detail it is necessary to put a scale to events to illustrate the “failsafe” ideology of Baby POP. One concept of “failsafe” is in terms of “at the very least we achieve our 3 primary objectives,” being the absorption of US Medial Liabilities and the elimination of fossil fuel dependence, the combination of which so as to achieve US long term economic strength. So Baby POP at the very least tackles all US Economic, Health, Energy problems, the latter of course also addressing Global Warming. The other contingent to “failsafe” is in the scale of capital needed to achieve the same. 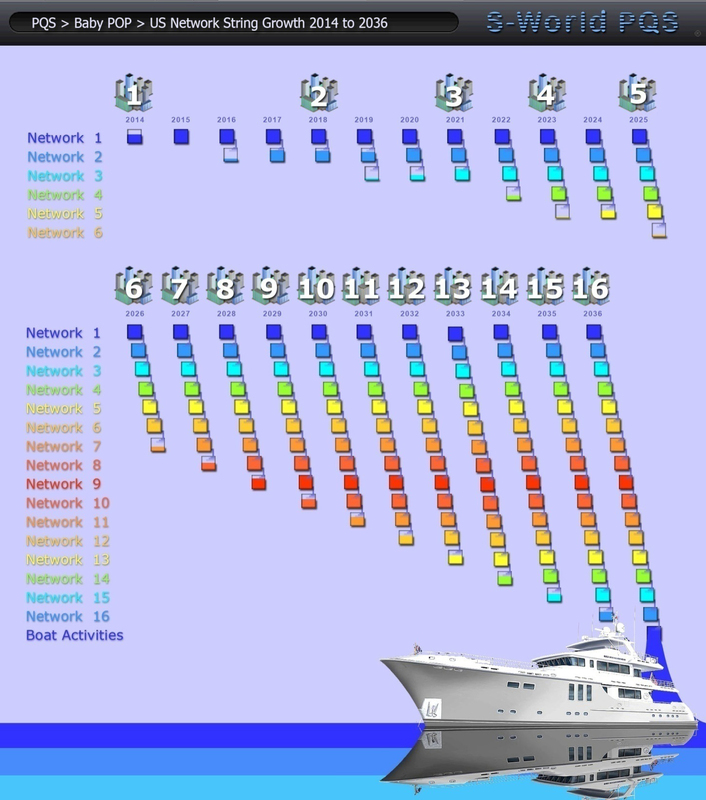 Focusing initially on the first set of Resort Networks, or as they are known within Baby POP “the Anchors” or Anchor Networks. I’m not particularly happy presenting an Anchor financial summary at this juncture as at the time of writing (2nd Oct 2012) a meticulous summary is destined for a later chapter. However, I must as its important to appreciate that the amount of capital needed for the success of Baby POP is akin to a drop in the ocean, between 15% to 30% of current PQS forecasts. Specifically, each Anchor of which there are 512, is required to generate $600 Million in profit come 2018, Whereby each Anchor is expected to generate between $2Billion and $5Billion. So before delving into the specifics and the magic of Baby POP, PQS expected forecast needs to be touched upon. I will however be brief on a subject that has immense substance and detail. First we shall consider the construction industry and the building suppliers. As per our “Suppliers Butterfly” from Chapter 2. The Window Factory invested $2.5 Million and showed 98% profit at $2,450,000 come 2018. Climbing to 429% profit at $10,750,000 come 2036. For now, we are only concentrating on 2018 but its important to have a baseline figure in one’s head for growth after this date. Working on basic ball park estimates of the $2 Billion in investment sectors available for each Anchor, considering the importance of construction assigning 10% of share allocation to this sector seems appropriate. As such we multiply The Window Factory’s profit by 80 equals $195 Million. Note actual building profits are assigned to the Operations Centre. This is profit made by the suppliers of all building materials. Next we come to e-commerce and Facebook and as detailed in chapter 5 an additional $275 Million. However, if one casts their mind back to the “GDP Buster” nature of the “Lx.” concept we remember Facebook’s markup was as low as 2.5%. Deliberately to stimulate spending from the superrich so manufacturers could make profit. Here is the total manufacturer’s revenue and profit breakdown. First we see the supplier’s revenue. Next comes a global breakdown assigning 33% to the USA, divided by the amount of Anchors. After which we apply the QE (Quantum Economic) Profit vs. Revenue Score which induces the profit of the manufacturer, the profit made by all their suppliers from base materials to sundries alongside the profit made from the companies that the staff and owners spend their Network Credits and Salaries on. This generates $1,2 Billion per Anchor, a significant sum, over double the Baby POP requirement. Whist there is no doubt in my mind that Facebook will join the party and indeed exceed these figures for the sake of “fail-safe’s” S-World commerce needs to be detailed. This is a book all to itself. S-World e-commerce has not yet been mentioned. However, it is central to every aspect: S-World VSN, S-World VBN, S-World.Biz, S-World PQS, S-World UCS will all be entangled with S-World e-commerce. Before going further it needs to be pointed out who owns S-World, its not going to be me, not a single share. S-World will be owned by the technology companies and the media companies, electronic media devise manufacturers and maybe the pharmaceutical companies. It’s a simple and yet highly complex affiliate system. That sees the likes of Apple, Microsoft, Google, Amazon, HP, Samsung, Nokia, Intel, Dell alongside most of technology companies. And most if not all media companies getting paid every time someone buys an item, be it a CD, a Holiday, a Mountain Bike, or a House. The figures work out that theses companies make far more via S-World revenue than they do from their current operations. Add to this S-World TV. Which is for the best part an Angel POP initiative that will be making half of the worlds films and TV series. Alongside S-World Sports, another Angel POP initiative, that see’s the current prize money in sports greatly overshadowed. Add to this S-Web. Basically controlling the internet as it is alongside the “per human results search engine” making such a goal fair. Include all the devises with S-World VSN, not the operating system per se rather the environment, offering all S-World software and media for free. I hope you are getting my drift. S-world will not make a play for e-commerce, S-World will be e-commerce. Why would partners allow rival companies who are not monitored for quality to trade. Especially when each purchase from an outer network company effects there bottom line, especially when rivals are not saving the planet. So if for some Bizarre reason Facebook e-commerce does not perform as expected, the concepts will prevail. I’ll not get into S-World Stores at this juncture other than to say they will be gigantic and exceptionally fun. All told the only way at this juncture to give a profit appraisal for S-World and all its suppliers is in terms of expected Facebook performance. And with Apple and Amazon alone having over half a billion members who have made e-commerce purchases and Facebook figures worked out on only 100 Million of there members signing up, well if we say S-World will double Facebook projection, I feel we are in a safe territory. So we see $550 Million for the combined tech media and pharmaceutical companies and $2.4 Billion for there suppliers. Buinessbook, aside from the Operational Income from the inner resort network activities, an additional income stream is generated from the sale of products to the public and trade for companies that are not currently core members, i.e. companies that have not yet invested in a Network. In this case a large commission will be levied, up to 100%. This will bring in substantial extra profit. But I’m not going to put a figure on it. Of course there is also money generated by the day to day trading in the networks themselves, travel, retail, and entertainment. Lastly comes the other 50% plus of industries that have not yet been considered. For these we defer to the question asked at the beginning of Chapter 5. America Butterfly Question, AB8: Has the case been made that technically the minimum any resort network can collectively make in 2018 is a 40% profit margin. Higher ________ OK ________ Lower ________? A question that has seen only positive responses. However, it needs to be noted that our Baby POP fail-safe only requires a 30% Profit Margin. As per the question above it is technically impossible to make less that 40% which is equal to $800 Million, only $600 Million is required. And before accounting for Buinessbook fees or any general resort spending, we have a well considered but loose PQS estimated 2018 profit forecast of $4.6 Billion. So we can walk into Baby POP with confidence regarding funding. Note as the Anchors create siblings and start to make strings, some or even most of the e-commerce manufacturer profits will be spread between the strings. And we are back to Baby POP firstly compared to the original New Sparta POP process. There are a number of adaptations. Firstly, GHB (Give Half Back) thresholds. Back in August 2011 the original POP worked on a 50% profit rake. However due to the entanglement of many circular events that makes the very nature of the expansion of the network ecological and philanthropic, in many ways the Give Half Back principle has been thrown out the window. It does however remain in place in name to describe three levies made by the Network on companies. The point to Baby POP is to turn an Anchor Network into a league or string of 16 Networks by 2036. With 256 individual Anchor Networks launched in 2014 and a second set in 2016. So creating 512 Network Strings of 16 totaling 8,192 come 2036. From 8,192 we work out the Medical Liabilities and Alternate Energy commitments which were detailed in Chapter 3. Where $100 Million per Network was required for Medical Liabilities. And for Alternate Energy two sets of $68.5 Million are required, one of which is within Baby POP. Added to this comes operational expenses for all university, research and operation centre activities of $125 Million. All totaling $296.75 Million per year, rounded up to $300 Million. However, the operation centre has many profit centers including all building contracts, money made from paying clients at the hospitals, energy sold, tuition fee’s and media payments to name but a few. All told the Operation Centre is expected to generate in the region of $200 Million a year, effectively making Baby POP. “Give Half Back” commitments $100 Million, which even at the lower projected network forecast of $2Billion a year has decreased “Give Half Back” to “Give one Twentieth Back,” and yet still fulfilling its purpose. Indeed, all factors combined and including the next chapters Angel POP “Give Half Back” vastly exceeds its initial economics and philanthropic ambitions, as such despite its technical inaccuracy, the name remains. Before continuing a technical note on the $200 Million odd in Operation Centre profits, this money will not be returned to companies pro rata to their contributions. Rather this money will be distributed evenly to all companies pro rata to their initial investment. For companies like Facebook who are forecasted to generate $275 Million a year an effective 3500% return on their investment, it’s water of a duck’s back. However, for companies that are less effective, this can become an excellent additional income stream. As such creating a set of companies within the network that have a dual focus in supporting the operation centre. To our right we see a graphic representing a breakdown of the Baby Pop process detailing the Anchor network and its first 3 siblings in its string. The dates are not specific to the creation of each network rather the point at which the Baby POP process starts, which is always in the 5th year. Let’s start by considering a standard business that in 2018 is generating the required 40% of its initial investment. To clarify, if a business initially invested $2Million, all network advantages included it is now making $800,000 a year in profit. This company will receive $125,000 in Network Credit dividends. It will invest $375,000 into a sibling network which as highlighted in the “Locations Butterfly” within Chapter 4 will return a capital asset of greater value alongside (if desired) a new income generating company within the sibling network. Lastly it will contribute $300,000 to operations and projects. However, as operations and projects return their profit, $200,000 will be returned to the investing company. Most likely in the form of more Network Credit Dividends. All told the company will have invested $2 Million. Per year from 2018 receive $325,000 in dividends and have gained over $350,000 in capital assets alongside a new income generating company if desired. All told including appreciation on the capital asset an approximate 40% return plus the opportunity of another income source. As such and ROI (Return on investment) in the region of 11 times the return of investing in US government bonds. Moving on to sibling networks we notice that the Baby POP and dividend returns are lowered. These two contingents are linked, in that Baby POP accounts for 75% and Dividends are at 25%. The lowering is to put a fail-safe to the fail-safe, alongside the notion of “we take only what we need.” In the broader spectrum of Network activity, it is the Operations and Projects that are a necessity. As long as this money is available, the US Economy, Health & Energy needs are covered. The lowering of the Baby POP threshold as will be disclosed is more than enough to create the Network String, from the 4th sibling onwards, the contributions stay the same. Note: Once these figures are met, Angel POP takes over, as presented in the following chapter. Above, once again we see the original graphic that inspired the POP investment process. Seeing the 8th network displayed in red, indicative of the potential “end of the line” where the battle ground began at the edge of chaos. A process that I envisaged seeing a forwards/backwards motion of the stabilization of a network one year and a decline the next. To our right, based on the precise data that is presented over the next 8 pages via spreadsheet, we now see a very different story. Where instead of the 9th sibling representing the end of the line, it represents the beginning of an ever easier road to string completion. As each networks small but significant contribution adds to the momentum. At the bottom of the graphic we see “The Boat,” this is representative of Baby POP contributing a whopping $2.7 Billion a year on top of the final sibling’s direct income. The reason for the name “The Boat” is its ability to venture forth. Its early days and not until the Boat is fully laden will its precise direction be considered. It will however first invest internally. Quite possibly in recourses and minerals up until the point when it is independently generating over $1Billion a year, as that is the POP stability point. That is the point where on the greater economic map of the network, it would appear on the map. From this point “The Boat” will most likely follow a number of avenues, investing into its own string. Bring all networks to stability. Creating a Super String Network as detailed in the following chapter, and creating Satellite Strings as also detailed in the next chapter as part of Angel POP. If you are reading this in word on a computer, the following pages will be difficult to follow as the full spreadsheet is split into 4 double page spreads. If you have a big screen please go to View > Two Pages, or click here to download the spreadsheet, or go to www.s-world.biz/downloads and download “BABY POP”. Above we see the first of 4 double pages illustrating the BABY POP 2014 to 2040 Network String creation. Starting with the basics top left RN stands for Resort Network. This is followed by the year. Following the row beneath after the 2014 we see initial investment, usually this comes in one chunk at the beginning of the process. However, for the first network, half ($1Billion) comes in the launch year the balance in 2016 and 2017. This is a provision allowing diligent choosing of appropriate local companies as partners within the timeframe. Next we come to annual profit $200 Million in 2014. Rising to $800 Million in 2017 totaling $2 Billion over the first 4 years, 50% of this profit is generated by the internal construction process. Moving over to the right hand side of the spreadsheet in 2014 we see the $200 Million recorded as cash flow and subsequently banked. In 2015 the process repeats. This time adding an additional $400 Million in profit to the $200 Million from 2014 so making $600 Million in the bank. In 2016 $600 Million is recorded as profit. This added to the $600 Million in the bank affords a $1Billion cash injection into the internal construction process. 2017 is the last year before the parent resort enters the BABY POP process. Until now all operational expenses are covered by the initial investment and no capital has been used for special projects. In 2017 RCN generates $800 Million in profit which when added to the $200 left in the bank allows a $1 Billion investment into the next resort network, RN2, the sibling of RN1. This $1 Billion is matched by new investment and becomes the start up funds for RN2. Before examining RN2 please look at the bottom (dark purple) line of RN1. To the left $800 in annual profit is recorded. To the right we see the profit split into 3 divisions, GHB (Give Half Back) is operational expenses, solar and energy projects & medical initiatives. Then the balance of $500 Million is split 75/25 with $375 becoming POP investment into RN2 and $125 returned to the company owners, or share holders as network credit dividends. RN2: Starting in 2018 RN2 starts immediately with $2 Billion in investment, half from RN1 and half from new sources. Each year added to their general profit $375 in BABY POP investment from RN1 is injected into the resort. So allowing the $1 Billion internal reinvestment in 2 years not three and the $1 Billion investment from RN3 in 3 years not four. Taking an overview above we can now clearly see the BABY POP process at work. Please cast your mind back to the BABY POP graphic that illustrated the cost of BABY POP decreasing over the first 4 years. In RN1 $375 Million, in RN2 $300 Million, in RN3 $225 Million and from RN4 onwards $150 Million. This is partly as a safeguard but more with regard to the principal that come in the 4th RC. That is all the capital that is needed to complete the league of 16 resorts in a timely fashion. So leaving additional earnings for other projects and networks. Come 2023 by the time of the launch of RN4 it is receiving over $1 Billion a year in BABY POP injections from RN’s 1, 2 & 3. This event occurs for 2 years where after combined with the POP from the 4th network enough is generated to make the process of creating a new sibling resort network an annual procedure. Important Note: As the Baby POP process diverts from sibling to sibling as soon as each is funded, companies within the Anchor, first and second siblings, develop strong footholds in every sibling in the string. In many cases opening new stores or business interests throughout the string. This of course will lead to greater and greater profits for initial investors. But more specific to the M⇔Bst Principle as opposed to relying on network logistics and PQS activity to force this process. It is in the interest of many, indeed most within the string, to work this principle as best it can be worked. Moving into the second half of the creation of a Resort Network String, come 2029 the network is flying. Recording just under $2 Billion a year from “POP Over” and “POP A to E.” By this point the POP process has for all intents and purposes created a mini tidal wave of profit which is all but unstoppable. Should any network have a hiccup, it will make little difference. Come 2034 and the launch of Resort Network 14. The tidal wave of Baby POP capital injections has collectively reached over $2.7 Billion a year from 11 different sources. Come 2036 the 16th & final Resort Network is launched receiving over $3 Billion in its first year. However, as RN16 has no sibling, instead of investing in a new sibling resort it strengthens by investing in itself procuring raw materials, minerals, metals and other tangible assets alongside building industry and energy resources. By its 5th year, the year it starts contributing to operations and projects before making a cent in profit, RN16 will have internally invested over $11 Billion dollars. This investment will undoubtedly result in the final sibling network internally generating over $1 Billion a year and so it becomes stable. Indeed a stable network that still receives $2.7 Billion a year from the BABY POP process. And so with the initial network RN1 receiving e-commerce profits and RC16 receiving BABY POP funds on top of its general profits, the first and last networks in the league have significant strength and make considerable profit. As such RN1 adopts the name “The Anchor” and RN16 “The Boat” as it is ready to sail on to new ventures. Exactly what these ventures will be is a question to be considered down the road. Some reinvestment into some of the weaker Resort Networks, Satellite Networks, other Global Networks, Special Projects or up, up and away to new and distant lands. Come 2040 these questions will be answered. Far more pressing however is what to do with the rest of the profit made from the first Resort Network as so far we have only illustrated BABY POP. In our immediate future we have POP1, 2 & 3 to deal with.